v1.11.28. - Took care a few bugs in new mode. Enjoy the story!. . v1.11.22. - New story mode! Join with Clyde and win the championship of Pets Race Cup!. - Candy shop is now open! Shopping time~~~. - Supports for multiple languages! Run, jump and race against friends in Pets Race, the amazing multiplayer runner where you race as tiny pets! 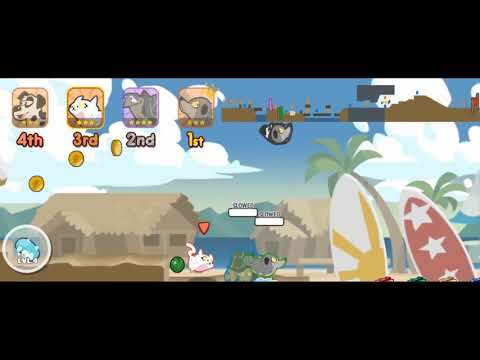 Put your PVP platformer skills to the test as you battle in online multiplayer for first place and collect special loot to keep your pets happy!Pick up items and boosts to slow down the compe... see more Run, jump and race against friends in Pets Race, the amazing multiplayer runner where you race as tiny pets! Put your PVP platformer skills to the test as you battle in online multiplayer for first place and collect special loot to keep your pets happy! Pick up items and boosts to slow down the competition as you dash platform to platform, leaving your competition in the dust. Don’t forget to collect coins to customize your cats and dogs and upgrade their pet world. You can even treat your pets with yummy foods! Download now if you love the idea of mixing racing games with cute cat and cute dog games! Aim for the finish line with friends in one of the most fun running games on the Play Store, Pets Race! • Animal racing Games: Race as cats and dogs against friends! • Fun Race: Avoid obstacles and get power-ups to help win the race! • Pets Runner: Choose your favorite pet and race against other pets! • Fun Run: PVP racing lets you chat with other players in your very own player lobby. Hang out and have fun! • Pet World: Collect coins to buy the animals treats and new pet beds for their world! • Pet Run: Play as cats and dogs. Have fun racing with friends! If you love fun running games and kart games, get ready to battle in this online multiplayer animal race and aim for first place in Pets Race!